Intelligence is at the heart of what makes us human, but the methods we use for identifying, talking about and valuing human intelligence are impoverished. We invest artificial intelligence (AI) with qualities it does not have and, in so doing, risk losing the capacity for education to pass on the emotional, collaborative, sensory and self-effective aspects of human intelligence that define us. To address this, Rosemary Luckin - leading expert in the application of AI in education - proposes a framework for understanding the complexity of human intelligence. 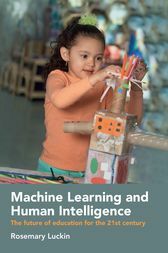 She identifies the comparative limitation of AI when analysed using the same framework, and offers clear-sighted recommendations for how educators can draw on what AI does best to nurture and expand our human capabilities.